People often associate protein shakes with bodybuilders and, by default, big muscles. Because many women don't want to bulk up, they may avoid drinking protein shakes. 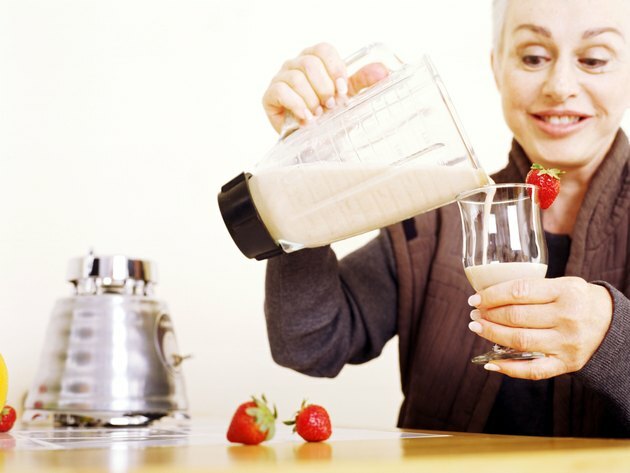 But some women may have good reasons to supplement their diets with whey shakes, ranging from improved body composition to better hunger control. As with all supplements, talk to your doctor before adding whey protein drinks to your diet. Several scientific studies have demonstrated that women who regularly consume higher-protein diets are more likely to lose body fat. In one study published in 2008 in the journal “Nutrition & Metabolism,” overweight men and women who supplemented with whey protein twice daily and followed a reduced-calorie diet lost significantly more body fat than subjects who supplemented with a low-protein beverage. Another study, published in the "Journal of Nutrition," focused on active women who were all cutting calories from their diets. In that study, subjects who consumed the most protein lost the most total weight and fat mass and retained the most lean muscle. Active females need more protein than their sedentary counterparts, and whey shakes may be an especially helpful addition to their diets immediately after workouts. According to a 2006 article published in the “British Journal of Sports Medicine,” active women have demonstrated a marked increase in successful muscle protein synthesis when they consume protein-rich foods after exercise, especially easily digestible proteins like whey. Muscle protein synthesis is the process of repairing and rebuilding damaged muscle fibers, and it is able to encourage gains in both strength and lean mass. Whey also has a proven effect on hunger control. In a study published in 2011 in the journal “Appetite,” overweight women who received small amounts of whey in drinks prior to a meal felt fuller and experienced better hunger control than women who drank water. That may be because protein is more satiating than fats or carbohydrates, meaning it has the potential to more successfully curb hunger, reduce cravings and limit overall calorie consumption. Shakes aren’t a magic solution for melting off fat, banishing hunger cravings and building more lean muscle. Women who want to use shakes in a plan to achieve positive physical changes need to combine them with regular exercise and a healthy, well-rounded eating plan to see the best results. In fact, if women rely too much on whey protein and other protein supplements, they may miss out on nutritional benefits of whole foods and experience higher risks of heart disease, kidney problems or osteoporosis. That's why it makes sense to speak with your doctor before making any major changes to your diet. What Are the Benefits of Protein Powder for Women? Does Protein Powder Make Women Gain Muscles?